My grandparents were raised on a farm and my mom used to visit her grandparents farm when she was little. So it was only natural that even though I was raised in the city, we had a backyard garden each year at our home. It wasn’t anything too big, but enough to grown tomatoes, rhubarb, and a few other vegetables. If you are thinking about starting a garden this year, I’ve got some tips on how to plan for one. When we were first married we lived in a mobile home in a mobile home park. It was cheap to purchase and the space rent was cheap but best of all, we could have our pets. We only had a small strip of land but we still had a garden it was a container garden. I grew strawberries in a strawberry pot. A few tomatoes in pots and a little lettuce too. It wasn’t much but it was nice to have a few fresh items we grew ourselves. If you are currently living in an apartment but have a balcony or a patio, you can plan for a container garden like we used to have. You can grow peppers and tomatoes in containers or even 5-gallon buckets with drainage holes in the bottom. 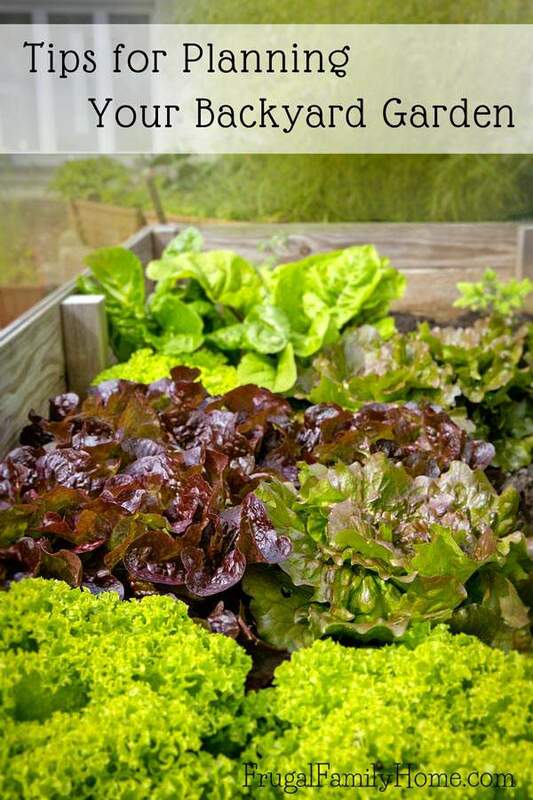 Lettuce and herbs can be grown in a gutter attached to a railing or even in a shoe organizer hung on the wall outside. Even radishes and small varieties of carrots can be grown in pots. When we purchased our first home, (you can listen to the podcast to learn a little about our first home here) we had a much bigger backyard, a quarter of an acre. It had big trees and lots of grass. We didn’t have time to have a big garden with both of us working and our daughter being so little at the time. We built planter boxes that sat right on our patio. It was close to the back door where I could easily see if it needed to be watered. It was near our covered patio where our daughter could play while I gardened and it was cheap to make and fill. We grew lettuce and radishes in the shallower boxes. In pots, we grew tomatoes and deeper rooted vegetables. I even had strawberries in a strawberry pot. At this home, we also had apple and plum trees too. It was a nice amount of food for our small family. Plus it didn’t take too much time to maintain. If you are short on time be sure to adjust the size of your garden to what will fit time wise for your family. If your family has lots of obligations that takes you away from home often in the garden growing months be sure to start small and build up each year. Make the garden easily accessible from where you enter the home, it will make it easier to keep an eye on the garden for needs like watering and weeding. At our current home, we have a nice open plot of land facing south. It’s the perfect location for a garden as it gets good sun most of the day. We started out square foot gardening with five 4 foot by 4 foot raised beds. As we needed to replace the boards on our raised beds we continued to expand them. We now have three 11 foot by 4-foot beds as well as one 11 by 3-foot bed with strawberries. We have two rows of raspberries under our maple tree as well as three rhubarb plants. I grow our herbs in pots on the walkway near the garden. I also grow up vertically with our cattle panel supports. We get lots of fruit and vegetables from our garden now, enough to share with other and because I’ve slowly built it up over the years it isn’t overwhelming to care for. So whether you have a small plot of land and a little time or you have a huge plot of land and lots of time there are a few things that can help your garden be more successful. Location, make sure you garden location gets at least 6-8 hours of full sun. We have neighbors that used their front yard to make into a garden because that was the best spot for it. Don’t just limit yourself to the backyard think outside the box and find the best sun area for your garden. Grow Up, we built ourselves the cattle panel trellises to expand our growing area. 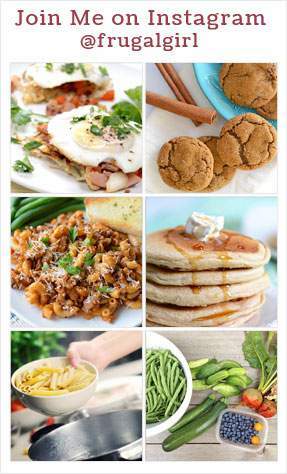 You can grow many plants vertically. Just make sure to plan for the vertical areas to be where they won’t be blocking the sun for other plants. Or if they do block part of the garden plant, plants that like a little shade like radishes and lettuce in those areas. Use Containers, even though we have a good size planting area I still use containers. If you are limited on space try using containers on your deck or hang a shoe organizer on the side of the house and plant in those. I’ve even seen people hang gutters on the side of the home in the sun and plant lettuce and herbs in those. Containers are a wonderful way to get started gardening. You do need to have a plan for watering every day or use a self-watering system or even water crystals to help maintain the moisture. But there is less weeding involved with container gardening. Know Where and When to Grow, do some research and know when and where to plant each of the seeds or seedlings. The first year I grew sugar snap peas it was a disaster, why because I didn’t research to know you need to plant them in early spring. I planted them in July. They never grew past a foot and the peas that grew were all shriveled and deformed. Now I get my peas in the garden by February and they produce beautifully. 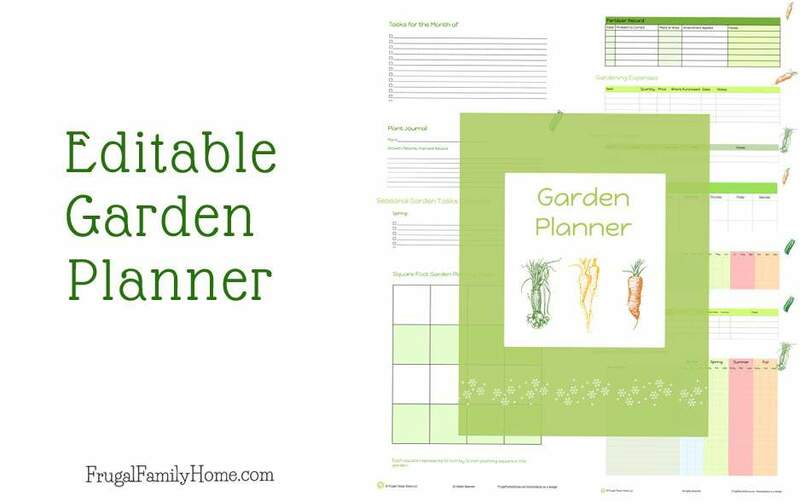 If you want to get your garden planned out, take a look at this garden planner. It has pages to record where and when plants were planted. Where the seeds were purchased and how they germinated. 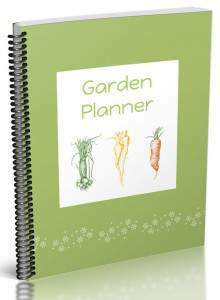 There are also journal pages to write down a daily, weekly, or monthly garden journal. You can see more about it here. 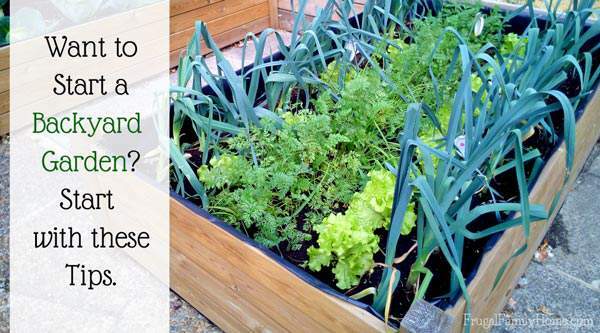 Do you have plans to grow a garden this year? If you do what kind of garden will it be? You should. I bet you could grow some great organic produce right at your home for so much less than the store bought produce. My friend even grew corn in a 5-gallon bucket a few years back.